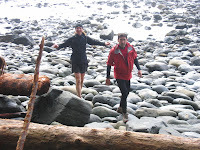 This was the second time that I had taken on the challenge of running the 47k Juan de Fuca Trail. 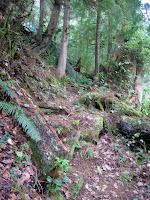 The trail is a challenging hike that would take the average backpacker 3-4 days to complete. My last time running it was last year, and even though it was very challenging to say the least, I had a blast. Last year, I ran the trail with Bob Wall and we finished in 8 hours. This year, I had plans to beat that time and to possibly challenge for the speed record, which is unofficially 7:15 (Rumon Carter). I had been training very hard through January and February, and I couldn't have been in better running shape. Having said that, everything was highly dependant on weather and trail conditions. The day began at 5:35 am, when the minivan convoy came to pick me up. In our group we had 7 runners: Bob Wall, Ludo (the crazy Frenchman), Caroline Goluza, her Russian boyfriend, Brad Holmes, the Jackal, and Myself. We had predetermined that we would be in two groups. I would be with Bob and Ludo in the fast group, while the others would bring up the rear. We arrived out to the China Beach Trailhead at 7:15am, and then after ensuring that we had all our gear, we set off at exactly 7:30 am. The daylight had just hit the trail. The timing could not have been better. The weather forecast was for cloud and sun, so everything looked ideal. Bob led the way for the most part, I was in the middle, and Ludo was at the back. The pace Bob set was great. It was fast, but not so fast that it was killing anybody. 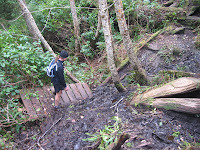 The trail looked also to be in good condition. Some branches were down, but nothing significant as of yet. As we made our way to Mystic Beach at the 2k mark, everything was smooth sailing. 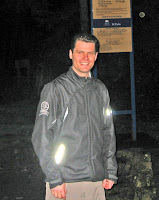 After about 100m along the beach, we quickly found the trailhead once again and headed up onto the trail. 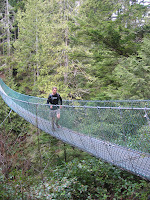 At the 3k mark, we passed over a massive suspension bridge - one of 3 on the trail. These 3 bridges are all simply breathtaking. At about the 4k mark, we saw a sign of things to come. 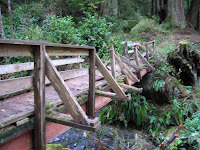 A bridge had been hit by blow-down. We simply skipped over it, and carried on. I was surprised to see so many branches down. I didn't think our Winter season had been a bad one, but obviously out on the West Coast it is a different story. We carried on. Up a hill, down a hill, over a ravine. Up a hill, down a hill over a riven, etc. This pretty much sums up the first 30k of the trail. 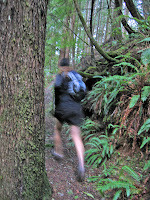 It is impossible to make great time on the trail. With so many hills and obstacles, it is really just a battle the whole way through. A true test of determination, strength, and will-power. At the 7k mark, we reached Ivanhoe Creek. This bridge actually had been closed by Parks, and had yellow flagging tape over it to prevent idiotic hikers, or runners to go over it. It was not safe. So we sent Ludo - the crazy Frenchman to go test it out. Like the little kid in Indiana Jones and the Temple of Doom, he walked to the middle of the bridge, held on tight, and jumped a few times. Fortunately, the bridge appeared safe, or at least, safe enough. One at a time, we all carefully ventured across. 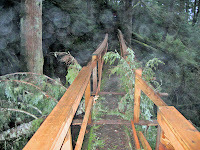 The bridges and the boardwalks on the entire trail were brutally slippery. On numerous occasions, we avoided using the wood walkways so that we would not slip. 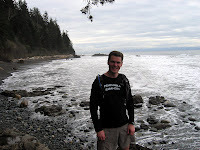 At Km 8, we headed down to Bear Beach and skipped along the pebbly beach. I knew we were making good time at this point. It seemed faster, and easier than the previous time I had done the trail. However, I knew that the worst still was ahead of us, so I reminded myself not to get too excited yet. The beach section in this part went on for quite some time (2k), much further than I remember it before. We also came very close to making a wrong turn on this beach section. This wrong turn was the cause of Bob and I getting severely lost last year, and I came very close to making the same mistake a second time. After Beach Beach, the trail gets extremely hilly. It is a powerhike the whole way through on this part. The legs slowly began to turn rubber-like with all the ups and downs, and it is pure punishment on the quads and hamstrings. In spite of this, we still persevered through and made good time on this difficult section. We attempted to short-cut some of the switchback ups and downs. Some successfully, and other times, not. I can remember one time where I went the wrong way and ended up buried in salal over my head, and watching my other two comrades take off down the trail. Eventually, we saw the emergency shelter at Chin Beach and this landmark was the indication that the hardest part of the trail was now behind us (or, at least we thought - this is what the map says!). Again, we did our best to get through the beach section. This beach section was about 1k long, and at the end of the beach, we stopped quickly to take a few photos, and take a quick bite. At this point, we were pretty much half way thorough the epic adventure. I remember Ludo at this point saying "God you guys are fast". I smiled, but also felt concern as I really hoped that he was not being pushed too much by Bob and I. Time would only tell. The trail didn't get any easier. Although it wasn't quite as steep, it certainly was hilly, and now another element of the trail began to reveal itself: MUD. This was no surprise, and right from the getgo, I decided to not tippietoe around the mud, but I just decided to go through it. 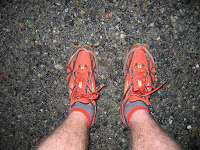 If you are going to do a trail run, and not wanting to get muddy, then you shouldn't be doing a trail run. That's the way I look at it. Eventually, we made our way to the Lost Creek Suspension Bridge at Km24. As it did last year, this simply took my breath away. The bridge spans across a canyon where there are 3 waterfalls. At the middle of the bridge, it is about 100m down to the bottom of the canyon. I think it is about the same feeling as being on the Capilano suspension Bridge. After a few token photos of the view, we were on our way again. 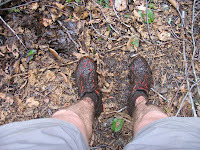 As we got onto the trail once more, the coefficient of mud increased by 300%. This part would be as bad as the very worst parts of the West Coast Trail. It was so muddy that at times, I got sucked in as far as my knees. Mentally, this was also a very difficult section because the pace just slowed right down, and the kilometer markers seemed to come with such difficulty. I knew there would be mud. But not this much mud. Anticipating this, I took a photo before and after of my shoes. We simply battled through. To keep the spirits high, Bob and I joked about things like "I wish we would see more mud! ", and "let's make sure we keep these 3 minute k's going!" Silly stuff like that, trying to take the edge off the mental game we were in. At the 34k mark, I took a photo of a muddy section, which shows Bob scrambling down a hill into a mud bog. This was not an uncommon sight along this stretch of the trail. However, we did eventually battle through and make it to Km36. At this point, there is a small dirt road section for a couple of minutes. Again, as the pace picked up, it only reminded me of how dead my legs were. They were pretty much destroyed. Multiple leg parts were now cramping, and I sucked back the water in my pack trying to avoid a complete bonk. I had two gels left, and knowing that my body was craving one, I had my second to last one. It seemed to do the trick for a few minutes, but I felt light-headed again by the time we hit the 40k marker. Ludo asked me how I was doing. I told him that I was struggling, and I think he was as well. To my chagrin, Bob once again seemed to be only getting stronger as the trail wore on. He had just tore up the last few kilometers, and at the 40k mark, he sped ahead out of sight. I, on the other hand, was not only walking, but walking very slowly. Ludo now was ahead of me out of sight as well. At the 41k marker, I knew I needed something, so I took my last gel. It didn't seem to kick in right away, but when I saw the 42 marker, I was jogging a bit when I was able. With my jogging now, I was able to catch back up to Ludo, and I think he was stunned to see me again. He probably thought I checked out. 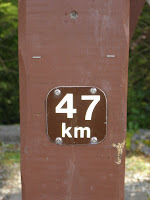 I kept jogging when I could, and eventually found the 46k mark - the road. I saw Bob there waiting. I was surprised to see him not at the very end - the 47k marker. I said to him, "have you been to the end already?". He said, "no, I'm not gonna finish the trail without my team." I then asked him, "how long have you been waiting?". He said about 10-15 minutes. He then asked me where Ludo was. So I told him that he was just a few minutes behind. And, sure enough, after a few minutes, Ludo came jogging up. He too, looked exhausted. We all walk/ran the last uphill kilometre together and finished. We finished at the 7:40 mark of our run. This was exciting for me. Not a record, but a huge improvement off last year's time. I thanked Bob, because once again, he pulled the weak guys (ie. me) through. I got to the car, ate my bagels and put on some warm clothes. An hour later, to my absolute surprise, Caroline ran up at a time of 8:40. Her boyfriend was right behind her. Then at the 9:05 mark, Brad and the Jackal came running up as well, and then went straight to the car for some beers. The weather at this point was sunny. The conditions were ideal throughout, the runners were positive and determined. What a way to spend a Saturday. I just checked out you blog site for the first time. Sounds like you had a great adventure last weekend... nice work! Came across this very randomly. Congrats on a great run! Love the before & after pics of the shoes; don't bother buying 'cause they're pretty, I always say.